Order for delivery of Delicious Combination of North Indian Recipes Lunch Gift Hamper to your special one. 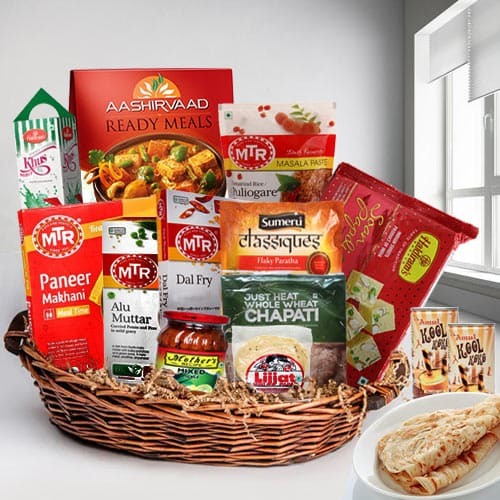 Lets celebrate with�this Basket full of North Indian Lunch items like One Pouch Lijjat Papad- Mini (Net Weight- 200 Grams), One Pouch Sumeru Classiques- Flaky Paratha (Multi Layered) (4 Pcs. ), Mothers Mixed Pickle, Haldiram Khus Syrup, Two Cans Amul Kool, Happydent Chewing Gum, One Carton MTR Ready To Eat- Tamirand Rice (Net Weight- 300 Grams), One Carton MTR Ready To Eat- Paneer Makhani (Net Weight- 300 Grams), One Carton MTR Ready To Eat- Dal Tadka (Net Weight- 300 Grams), One Carton Aashirvaad Ready Meals- Navratan Korma (Net Weight- 285 Grams), One Carton MTR Ready To Eat- Alu Muttar (300 Grams), One Pouch Id Just Heat- Whole Wheat Parota (Net Weight-350 Grams) (3 Pcs.) and One Pouch Haldirams Soan Papdi (Net Weight- 250 Grams).